Frictional contact is an important component of rock cutting with a blunt cutter. 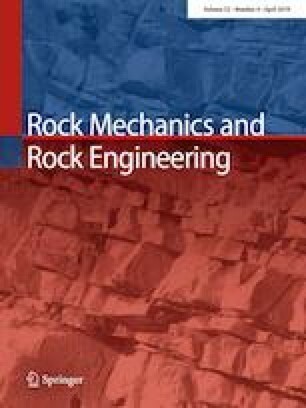 There has been a gap in knowledge of frictional contact between experimental tests conducted on quasi-brittle rocks and previous numerical and analytical analyses on elastoplastic rocks. The average contact stress between a sliding wear flat and a rock is generally overestimated in previous studies without considering material length scales. This study analyzes the contact stress using an elasto-plastic-damage model that accounts for the material length scales of quasi-brittle materials. The constitutive model is developed for quasi-brittle materials by incorporating fracture energy, and it is implemented in the commercial finite element software ABAQUS as a user-defined material model. The implemented constitutive model is verified under uniaxial tension and compression. The average contact stress in frictional contact is mainly governed by a dimensionless elastoplastic parameter \( \eta \) for an elastoplastic rock, while it is predominantly governed by two dimensionless parameters: an elastoplastic parameter \( \eta \) and a brittleness number \( \xi \) for a quasi-brittle rock. The dimensionless elastoplastic parameter \( \eta \) contrasts the magnitude of a characteristic elastic contact stress to the yield strength of a material, and the brittleness number \( \xi \) is the ratio of a geometrical length scale to a material length scale. The tool–rock interface can be approximately divided into an elastic zone and a damage process zone. The contact stress generally increases in the elastic zone and then decreases in the damage process zone towards the tip of the slider. The average contact stress generally increases with the dimensionless elastoplastic parameter \( \eta \) and then levels off at a limit value, and it generally decreases with the brittleness number \( \xi \). This study reduces the gap in previous studies to some extent by introducing the brittleness number \( \xi \) in frictional contact. The current numerical results of the average contact stress are generally consistent with typical experimental results conducted on quasi-brittle rocks, despite limitations in the finite element modeling. This work was funded by the Center for GeoInformatics (C4G) at the Louisiana State University. The second author acknowledges gratitude to Professor Emmanuel Detournay at the University of Minnesota for the benefit of stimulating discussions that inspired this work.